When Ohio State offered Zak Zinter on Sept. 17, the Buckingham Browne & Nichols (North Andover, Mass.) offensive tackle said he was both "caught off-guard" and "excited." That day, he started a phone conversation with Ryan Day and ended with Urban Meyer, who eventually gave him the scholarship offer. Since then, Zinter has done nothing but get better ... and his team has reaped the benefits of that development. 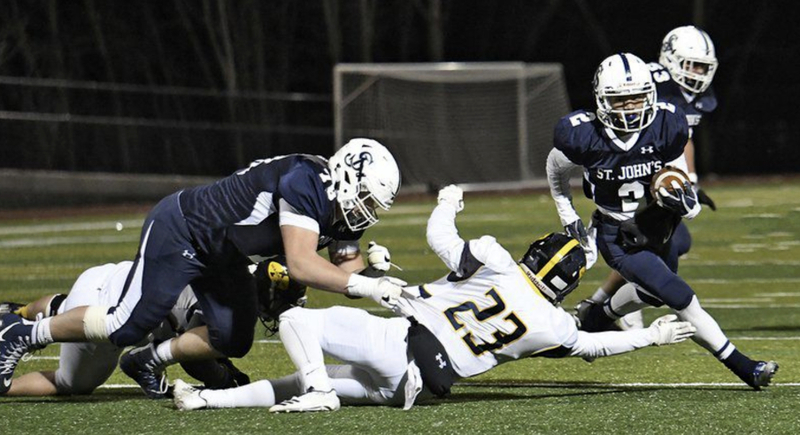 "We are 7-1, just clinched the Independent School League championship and will be playing in the Kevin Driscoll Bowl game against Avon Old Farms this Saturday," Zinter told Eleven Warriors. "And just today, I was named the 2018 ISL Lineman of the Year." Since the Buckeyes extended their offer, multiple schools have followed suit including Michigan, Northwestern, Tennessee and Pittsburgh. Zinter has taken visits to Stanford, Boston College and Michigan as well. "All of my offers are Incredible opportunities. I’m trying to get out to as many of them as possible that my schedule will allow," Zinter said. "I want to get on the campus, take in the facilities, and see if it has that 'home' feeling. I’m looking for a high academic school that plays big-time football." A visit to Ohio State could be in the fold. After all, the Buckeyes' coaching staff is no stranger to Zinter and that big-time football feeling ... yeah, that's Columbus. "Absolutely I’ve been keeping up with OSU," he said. "I keep in contact with coach Meyer, coach Day and coach [Mark] Pantoni very often through the week." As Zinter's recruitment process continues to make progress, the 6-foot-6, 300-pound three-star prospect knows what he needs to do to get better. Currently, he's ranked as Massachusetts' third-best overall prospect in the class of 2020 and as the nation's 47th-best offensive tackle — both numbers he hopes to improve upon. "I am constantly working on always getting better, faster, stronger, quicker. There’s always room for improvement, no matter the level of athlete that you are," he said. "I always focus on my schoolwork and football training first. Then at then end of the day, I’ll return texts and DM’s. It can be a lot but I’m taking it all in and enjoying this awesome process." The All-American Bowl Selection Tour finally reached California Thursday afternoon and stopped along the way to present Concord tight end Isaiah Foskey with his All-American jersey, signifying his participation in this year's All-American Bowl in San Antonio, Texas. Foskey, a 6-foot-5, 233-pound, four-star prospect, told 247Sports that he's "been thinking about playing in this game since I was a little kid. I had a poster of it on my wall. I cant even describe the emotions. Before the ceremony, I was nervous and excited at the same time. But mostly excited to be getting my jersey and know I'm playing in the All-American Bowl." Ohio State offered Foskey on Feb. 6. Since, he's named the Buckeyes as one of five finalists in terms of his college decision, alongside California, Michigan, Notre Dame and Washington. The 2019 recruit is rated as California's 24th-best overall prospect and as the nation's 10th-best player at his position. It's important to note that Foskey's positional ranking is at defensive end. The Buckeyes and Wolverines are recruiting him as a tight end while the other three finalists are looking at him as a DE. Foskey, who has plans to make his final decision in February, says he'll likely make an attempt to visit Ohio State, as well as Michigan, after the dead period. Massillon (Ohio) Washington's wide receiver pair of Tre'Von Morgan and Jayden Ballard have been two big reasons why the Tigers are still undefeated this season. Washington is currently 12-0 with a Week 13 matchup against Wadsworth looming this weekend. Friday morning, Washington head coach Nate Moore tweeted that both Morgan and Ballard have added to their already long offer lists. Morgan, a 6-foot-6, three-star prospect who doesn't yet have an offer from Ohio State received an offer from Michigan State while Ballard, a 6-foot-2, four-star prospect who received an offer from the Buckeyes on June 8, earned an offer from West Virginia. Morgan is in the class of 2019 and has offers from Cincinnati, Missouri and Pittsburgh, among others. Ballard, who has been named among the best receivers in the class of 2021, boasts offers from Boston College, Pittsburgh and Washington State. For what it's worth, Ballard has six crystal ball predictions that have been entered with all six pointing towards the Buckeyes. Of course, much can change between now and the time he makes his college decision, but it's a good start for Urban Meyer and crew.